​​​​​​Two types of newborn hearing screening tests are used to examine hearing in babies. Both of these tests are safe and comfortable. The two tests can be used separately or together. Both tests are reliable. Hospitals choose the type of screening tests that they use based on costs, personnel and the number of babies born. In some hospitals, babies are first screened using OAEs. Babies who do not pass on the first OAE test can be given a second test using the ABR. Infants who spend more than five days in the neonatal intensive care unit (NICU) should receive the ABR test. A miniature earphone and microphone are placed in the ear, sounds are played and a response is measured. 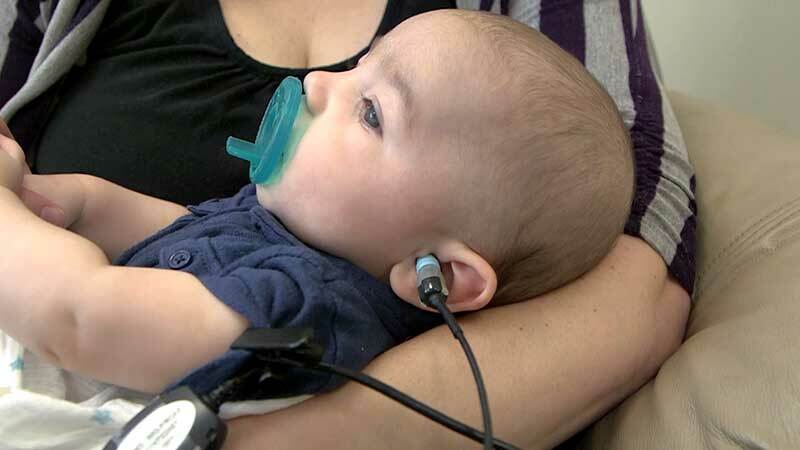 Auditory brainstem response (ABR) testing is the best test available for newborns and infants up to 6 months of age that can provide information about the softest level of sound the ear can hear. 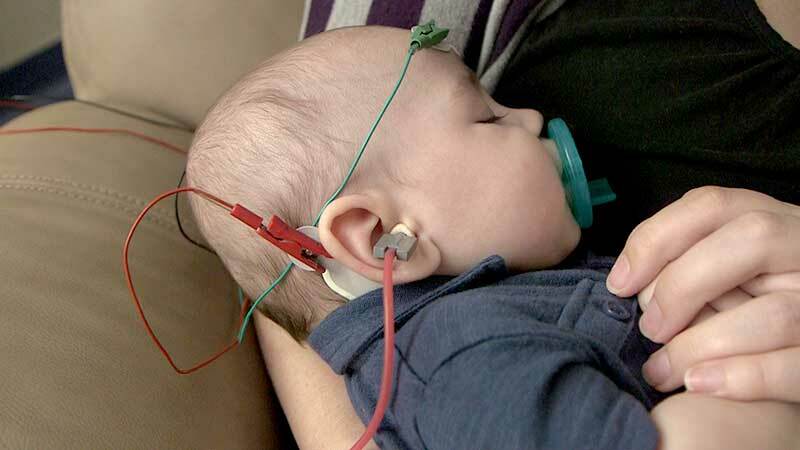 Sounds are played to the baby's ears and band-aid like electrodes are placed on the baby's head to detect responses. Sounds are presented to the ears using small earphones. The electrodes pick up responses from the hearing nerve and a computer measures the responses to identify babies who have a hearing loss. All hospitals in the United States screen for hearing loss. These simple very relatively quick screening tests are done in the nursery usually before the babies are discharged home. We have two methods to test newborn hearing. One is called otoacoustic emissions and the other is auditory brainstem response. The OAE or otoacoustic emission, we put a small ear probe in the baby’s ear canal and then play a sound and the ear sends back an echo. That test on a sleeping infant can take less than a minute. We test each ear. It’s important to know how the hearing is in both ears. So if the baby passes that test we wouldn’t necessarily recommend another test unless there were certain what we call risk factors for developing hearing loss later in life. For the ABR we actually put little electrodes on the head, usually one on the forehead and one behind each ear. And then again we play a sound to the ear and we can measure the response and we are measuring the response from these little electrodes. Both newborn screening tests are completely painless. They are very safe to do on newborns. They are relatively reliable, but they are a screening test. If the baby doesn’t pass the newborn screening regardless of which method is used, we will want to do a more complete test. For more information about newborn hearing screening, visit the National Center for Hearing Assessment and Management​.